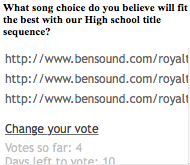 To help decide what non copyrighted music we would use, i went onto bensound.com and tried to find the music i believed would best fit our light hearted title sequence, the music i was looking for needed to be fun and fast paced, just like our title sequence. On the website i had found three songs that i believed will fit the title sequence, however from this i did not just choose the song i liked most but decided to put them into a questionnaire on my blog, this questionnaire last until the end of march, whatever one is the most popular will be put onto the blog, as it stands the music with the most votes is 'happy-rock' with three votes. I used a questionnaire to help decide what song to use due to wanting to know what others believe will fit the title sequence the best, this way not only do we have the use of mine, Jasmines and Brontes feedback but also the rest of the class.